Tropical Storm Bret, the second named Storm for the 2017 Atlantic Hurricane Season formed near Trinidad on June 19, 2017. TS Bret impacted Trinidad and Tobago and Grenada during Monday night, June 19, 2017 into early Tuesday morning June 20, 2017. According to the National Hurricane Center, Miami Florida, as at 11:00am (AST) Tuesday June 20, 2017, the center of Tropical Storm Bret was located near latitude 11.6 North, longitude 64.4 West. 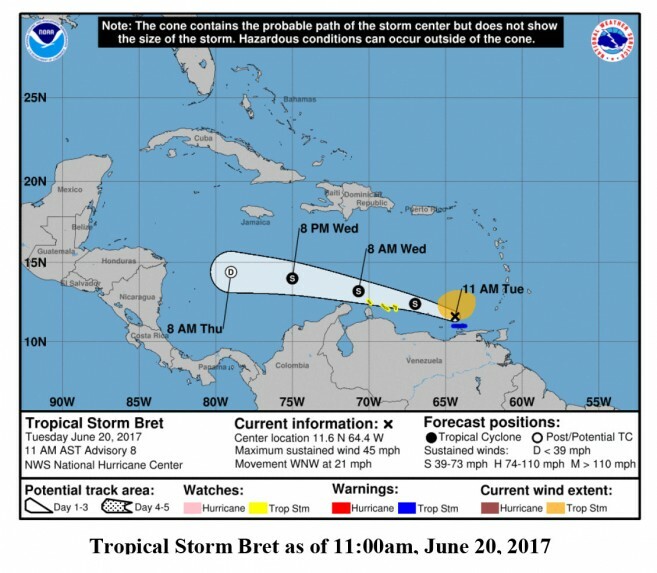 Bret is moving toward the westnorthwest near 21 mph (33 km/h), and this motion is expected to continue through tomorrow. On the forecast track, the center of the tropical storm or its remnants will continue to move across the southeastern Caribbean Sea for the next couple of days. Maximum sustained winds are near 45 mph (75 km/h) with higher gusts. Weakening should begin today, and the system is expected to dissipate on Thursday. Tropical-storm-force winds extend outward up to 125 miles (205 km) to the north of the center. The Caribbean Institute for Meteorology and Hydrology (CIMH) provided CDEMA a briefing at 10:30am, Tuesday June 20, 2017.  Bret continues to have a fairly well-organized appearance on satellite imagery. However, no significant short-term strengthening seems likely while the circulation interacts with Venezuela today. In 24 hours or so, a weakening trend should commence due to strong south-southwesterly shear associated with an upperlevel trough over the Caribbean Sea.  Observed rainfall of 4 – 5 inches for Trinidad during the period 19/06/2017 (09:29) - 20/06/2017 (09:30) UTC.  Rivers in Trinidad continue to be swollen in some areas and should continue to be monitored. Disclaimer: CIMH is providing special weather interpretation of the current and forecasted tropical weather affecting the Caribbean region. CIMH is not an official forecasting agency. impacted States. The following provides an update based on the initial reports of the impact sustained in the affected Participating States. The Office of Disaster Preparedness and Management (ODPM) reported that assessments are ongoing following the passage of TS Bret.  The Tropical Storm Warning was lifted at 5:00 a.m. on Tuesday 20th June 2017.  The NEOC is still activated.  The Airport reopened as at 5:00 am today, June 20, 2017. Full operations have resumed for all inbound and outbound flights. Units (DMUs) have activated their response mechanism and have pre-positioned their resources.  55 Shelters (Trinidad 52, Tobago 3) are on standby.  There has been an upsurge in the number of reports of fallen trees, fallen power lines and blown roofs. There are areas still inaccessible due to flooding.  Four (4) Health Centres are reported flooded (Todds Rd., Richard Douglas, Flanagin and Penal Rock Rd.).  Electricity and communication restoration are ongoing.  All DMUs are currently engaged in conducting Initial Damage Assessment (IDA) in their respective areas.  Citizens are advised to follow the advisories from official sources such as TT Met Office and ODPM and the Tobago Emergency Management Agency.  Damage includes: Roofs blown off, down utility poles, major flooding, beach erosion etc.  Two shelters were opened in the South of the island and housed one family each.  The shelters were eventually deactivated at approximately 6:00 am Tuesday 20th June 2017.  The Met Office reported wind gusts of up to 55 miles per hour.  Water was shut off at 8:00pm.  All clear formally announced at 6:35 a.m. by the Minister.  Schools resumed and persons returned to work as the state of normalcy returned.  No report of major damage.  Police reported no major incident.  NEOC deactivated at 6:45 a.m. Tuesday 20th June 2017.  NEOC Partially Activated since Sunday 18th June 2017.  The Ministry of Education made arrangements for the students from the family islands that attended school on the mainland to return home early. All schools are closed today, Tuesday June 20, 2017.  News releases were issued at 6:00 a.m. Tuesday June 20, 2017. Queens Drive, Prospect and Calder Ridge.  There were also reports of gusty winds throughout St. Vincent and Grenadines overnight. The CDEMA CU and the United Nations Resident Coordinator convened the second meeting of the Eastern Caribbean Development Partner Group – Disaster Management (ECDPG-DM). Twenty four (24) participants from national disaster offices, regional and international donor, humanitarian and development agencies (including 17 joining via online) were in attendance. The meeting, which was held at CDEMA’s headquarters in Barbados at 10:30am on June 20, 2017 provided participants with updates from the CDEMA CU on the impact to Participating States and regional readiness actions. The Regional Response Mechanism (RRM) including the response specialised teams remain on standby to provide assistance to any of the impacted Participating State should they request such assistance. CDEMA CU continues to monitor the situation and will provide updates as necessary. CDEMA will continue to monitor the system and provide updates as is necessary.